Apart from adjusting to the “ludicrously large” size of the iPhone 6 Plus, it’s been smooth sailing. (I even missed the brouhaha over iOS 8.0.1, for once not pouncing on the software update the moment it was available.) As with any shiny new gadget, there are lots of things to try. With the new hardware and software came enhanced time-lapse, and slow-motion video features. On the slow-motion video front, the first and last chance I’ve had to play with it was when I walked out of the Apple Store last Friday and met up with Ramsay Wharton, a reporter for Hawaii News Now. The 240 frames-per-second capture is pretty impressive. I’m sure it’d be even more impressive with something more interesting to watch than a geek and a newscaster dance. As for time-lapse video, I was very interested in comparing Apple’s built-in setting against a dedicated time-lapse video app like iMotion HD. (Check out the iMotion HD time-lapse videos in this post from August 2012.) I taped my giant iPhone to the visor of my car and recorded the drive into work from Mililani to Iwilei, and the drive home. Apple’s time-lapse video feature only runs at one speed, compared to iMotion HD’s many adjustable settings. Also, the camera seemed to struggle with focus, even with the iPhone 6 Plus’ optical image stabilization helping out. 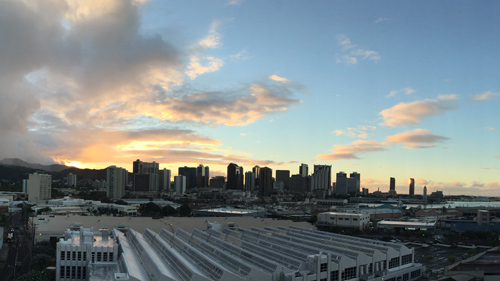 My second experiment, from a stable spot atop the parking structure at Dole Cannery, turned out much more beautifully. horizontal screen so difficult to view video clips. FYI.